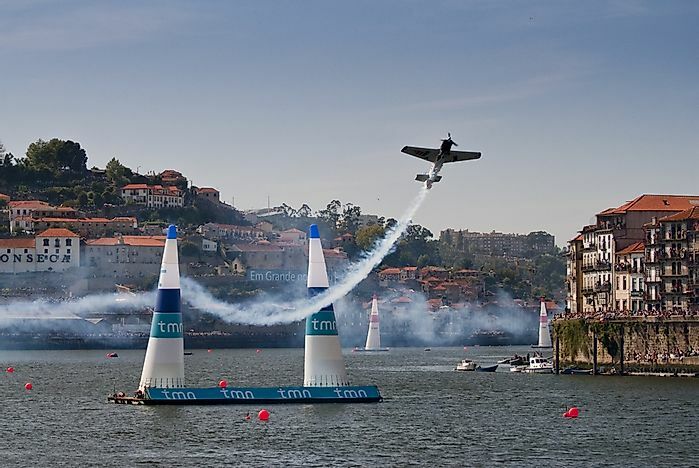 The Red Bull Air Race is a worldwide air competition started in 2003. The Red Bull Air Race is a worldwide air competition started in 2003 by the Austrian company which makes the Red Bull energy drink, Red Bull GmbH. Pilots are on the clock to fly and maneuver through turns called Air Gates. Races are usually held over natural wonders, in airfields, and over water bodies near cities. The race is held over a weekend with the first day being the qualifiers and the next day being the finals. After the finals, the race is preceded by air shows. The race is divided into the master class and the challenger class, and this is according to the type of aircraft used in the race. Pilots in the challenger class race using an Extra 330LX while those in the master class are allowed different aerobatic aircrafts. The championship is usually widely attended. The Red Bull company has a unit responsible for coming up with new sports around the world, and the team came up with the air race in 2001. The goal of the race was to test the pilot speed, skill, and accuracy. An air path with hurdles was set to be built. In 2002, build out of the Air Gates begun, and the pilot Peter Besenyei from Hungary was the first to test the gates. The first air race was held in 2003 in Zeltweg, Austria with the second one near Budapest, Hungary in the same year. There were three races held in 2004; in Reno, USA; Budapest, Hungary; and Kemble, England. In 2005 the air race became a world series with seven races and ten pilots competing that year. Races from 2011 to 2013 were canceled to allow for restructuring and to impose of new safety rules, and the series resumed in 2014. In years up to 2006, the fastest time during the two qualifier races started last, and the actual race had two rounds with the winner being the pilot with the most points. A few days before the race, pilots are offered four training sessions split into two days and to participate in the actual race a pilot music has attended at least two training session. The qualifier races are held a day before the actual race and are two races with the pilots with the fastest time qualifying. The actual race takes place in three phases, which include round of 14, round of 8 and final 4. The pilots fly a 3.1 to 3.7 mile long fixed track through air gates. Seconds are added to a pilot’s flying time as a penalty for breaking the rules with the maximum number of penalty seconds per breach being three and the minimum being one. One or two pylon markers of 82 feet tall and 33 to 49 feet apart make the air gates. Martin Jehart, an Austrian engineer with Bellutti Protection Systems, made the first air gates. The first gates were cylindrical and were made using ripstop nylon, and this would burst once hit by an aircraft. The Air Gates should be able to rip apart when hit by a plane and also be robust enough to withstand extreme weather conditions like strong winds and storms. In 2004, the cylindrical gates were changed to cone ones which proved more stable. The pylons today are made up of six attached sections which make them easier to repair if hit by a plane. Most of the participating pilots who have made it to the qualifiers have been from Europe and the US. Some countries in Asia like Japan and China have also taken part in the races. The current title holder of the master class is Cristian Bolton from Chile and in the challengers class is Melanie Astley from France.